“Make it through the door, Jamie. Make it through the door.” Those were my first thoughts as we were leaving the pediatric ophthalmologist appointment for my daughter, Callie (age 4), after her doctor mentioned that we should look into something we had never heard of before, Marfan syndrome. The door I was referring to was the front door to the building, the building I initially thought we were going into just to get our daughter some glasses. I needed fresh air immediately and for my daughter not to see me break down into tears. 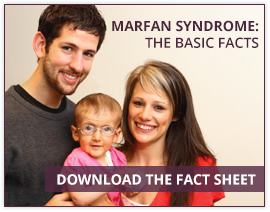 “What is Marfan syndrome and why are you mentioning her heart and the need for a cardiologist appointment?” I can remember vividly asking those questions to her eye doctor. The next couple of days were a bit of a blur, but what I can recall, and am so utterly thankful for, is that The Marfan Foundation website helped to quickly bring me out of that dark place surrounded by fear, worry and sadness. I’m an action-oriented, goal-setting working mother of one and, although I felt a rug had gotten swept out from under me, The Marfan Foundation website was my trampoline base that bounced me right out of it and on to taking action. Cardiologist appointment, check. Pediatrician update call, check. Geneticist appointment, check. Research, research, research and more research, check. All of this action and information came directly from The Marfan Foundation website – that was my first impression of the Marfan community and I’m so grateful for that. Don’t get me wrong, seeing some of the information was frightening at times, but it was good information and I knew it would be a place for accurate information. I could choose to put blinders on or I could choose to educate myself and be aware…and the blinders wouldn’t help anyone, especially Callie. "As iron sharpens iron, so a friend sharpens a friend (Proverbs 27:17)." We knew Callie was surrounded already by the love and support of our family and friends. However, what we never anticipated was the “open arms” love we felt from the Marfan community so quickly. Although Callie was officially diagnosed a short two months ago, we have already made some great connections, reminding us that there is no way we are going at this alone. Ideas, experiences, advice and love would be exchanged instantaneously through these connections…and it’s just the beginning. Our first connection was through a friend my husband, Justin, met on the basketball court whose good friend had a long history with Marfan syndrome. We immediately connected and when I received her first email with her story, I broke into tears. Not because of sadness or fear, but because of sheer gratitude that we had the opportunity to meet. She is a mother of a daughter Callie’s age with Marfan syndrome, her late husband had Marfan syndrome and I could tell immediately she was a “difference maker.” She has really done some amazing things to help bring awareness and raise money for The Marfan Foundation through Run for Izzo. Thank you, Mindy Izzo Hartzler, for your immediate friendship and being my wonderful first friend in the Marfan community. Next was our trip to Washington, DC, for the Marfan syndrome Congressional briefing where we met several others – again, experiencing a heartfelt welcome and ensuring we didn’t leave without exchanging information and even scheduling follow-up times to meet and connecting us to others. It was truly amazing and, if we didn’t do anything else that trip, it was well worth it. During the visit, we had a chance to meet Rod and Owen Gray (father and son) who live just a suburb over from us in Houston. Owen has Marfan syndrome so immediately Justin and Rod connected on a father-to-father basis. They recently met over lunch and Rod has talked to Owen’s cardiologist to get her thoughts on Callie’s cardiologist…now that’s looking out for each other and what I call community. I certainly don’t feel that Callie is “lucky” to have Marfan syndrome, but she is lucky to have the Marfan community. And for that, I am grateful. So my very first thought of “Make it through the door, Jamie” wasn’t that far off except instead of heading towards a door of fear, I am now confident that we are heading towards a door of opportunity to make a difference, bring awareness, and fight for a cure… alongside all of the others in the Marfan community who are striving to do the very same thing. From a parent’s perspective, it is my duty to bring awareness in every opportunity I can for Callie, others affected by Marfan syndrome today, and future generations that will be affected by Marfan syndrome. I am confident Callie’s early diagnosis was due to a lot of previous, relentless efforts by those in support of the Marfan community to educate and to increase awareness and how can I better repay that than to pass it forward. Note: Please join Jamie in her efforts to help Callie and all with Marfan syndrome and related disorders by reading more about Callie and supporting Callie’s Crew in the Houston Walk for Victory. Jamie is marketing manager for an oil and gas company in Houston. Although her passion is marketing, she also loves cycling, triathlons, and running. Her greatest passion, however, is her role as a mother to her daughter and sidekick, Callie, who was recently diagnosed with Marfan syndrome in December 2015 at the age of 4.